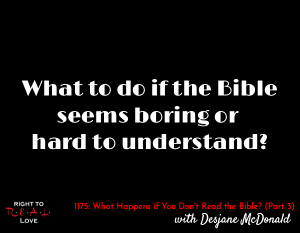 In this episode, Yahnathan continues his discussion with Desjane McDonald by addressing the question: What to do if the Bible seems boring or hard to understand? What to do if the Bible seems boring or hard to understand? Reasons people neglect reading the Bible or decrease the amount of time they spend reading the Bible. Ways to approach reading the Bible. Why the Bible is not a boring book.